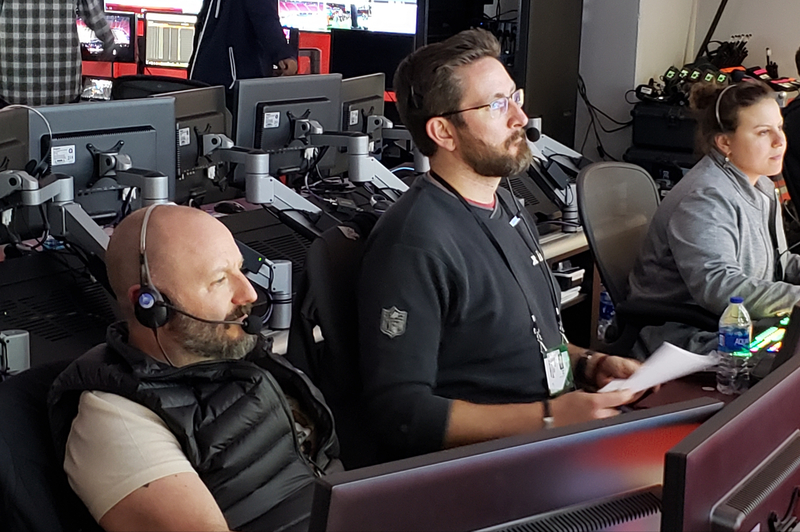 When Bob Becker, EVP, Van Wagner Sports and Entertainment (VWSE), was working his first Super Bowl, XXIX in 1995, on the in-venue video show, it was easy to keep track of the production team: it had only two people. For today’s big game, a team of 45 has been working hard for months, and many have been onsite for more than two weeks, working closely with the AMB Sports + Entertainment team to ensure that fans today get a great experience. “The technology has changed, the game has changed, and the business of game presentation has changed as well,” says Becker. 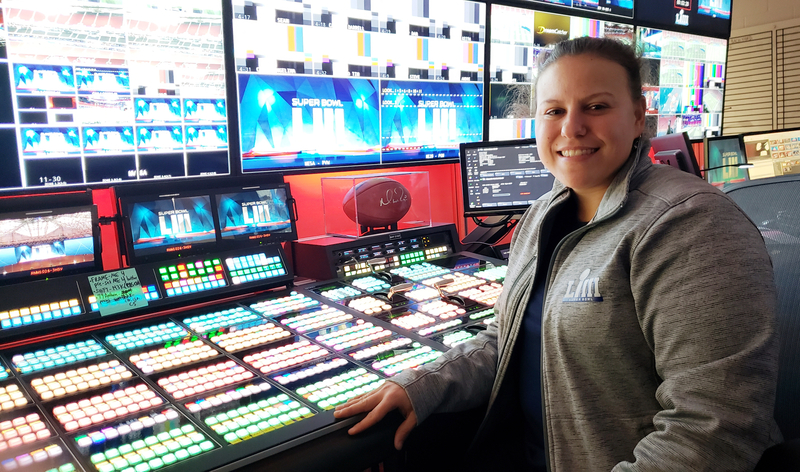 Julia Chongarlides will serve as TD at Super Bowl LIII, a role she also handles for Atlanta Falcons games. Topping the list will be four 360-degree videos that have been specially created for the Halo board, the 360-degree circular videoboard hanging in the middle of the stadium. The VWSE team works closely with the in-house video department, which is experienced with the control rooms, how to get the most out of the boards, and more. He adds that, for the Super Bowl, three simultaneous shows are being produced by three teams: the game presentation, the up-to-the-second stats for the game, and a show for the ribbon board that complements the other two shows. The VWSE team has worked the board before, for the 2018 College Football Championship Game between the University of Alabama and the University of Georgia. One of the challenges then was that the scoreboard-control room had one only Ross Xpression Tessera system, which is used to deliver content to the Halo. With only one system, the team could not upload content and create it at the same time. Key to the success is the merging of the VWSE team with the local venue team, and Becker has a bit of an advantage this time around: he previously worked with Pete Soto, senior director of game presentation, AMB Sports + Entertainment Group, in Miami for the Florida Marlins. From left: VWSE’s Brian Scott and Ryan Kehn and AMB Sports + Entertainment’s Julie Chongarlides are on the front bench for Super Bowl LIII’s in-venue show. The team on the front bench exemplifies the cooperation, comprising two VWSE staffers — Executive Producer Brian Scott and director Ryan Kehn — and AMB Sports + Entertainment’s Julia Chongarlides, TD for the in-venue show. She serves as TD for the Atlanta Falcons games and also spent half a season as TD for Atlanta United. Midway through the MLS season, she became director of the United games and also directed the MLS Cup for 74,000 fans. She will once again get to tell the story to a packed house, and she, Kehn, and Scott will have 18 cameras and four network feeds to work with, for a total of 22 sources. Chongarlides has a lot of experience creating videos for the Halo board. She says the team works with 11 looks, including a 180-degree canvas that measures 10,000 pixels across and 1,080 pixels high. She has learned to shoot really wide, even when the video is running on a quarter of the screen, which measures 5,042 x 1,080. The extra help also extends to vendor support. Gaines Johnson, field applications engineer, DreamCatcher, Evertz, has been onsite to ensure that the DreamCatcher replay systems are running at full speed.